Lord Lambourne was introduced in 1907 and is very much in the tradition of classic English high-quality dessert apples. It has the pleasing uniform shape - round, and not too flattened - and typical orange flush over green, with a hint of russet. On biting into a Lord Lambourne the first thing that strikes you is the juice and acidity. The flesh is creamy-white and quite crisp, and the flavour is pleasantly strong. It is a fair bet that such a high-quality aromatic apple will have Cox's Orange Pippin somewhere in its ancestry but the link is not certain. The immediate parentage is James Grieve and Worcester Pearmain, and the parentage of James Grieve is not known although Cox is a contender. If so, then the aromatic flavour of Cox is rather more apparent in Lord Lambourne than in James Grieve, although the James Grieve acidity is still prominent. Lord Lambourne has two siblings which share the same parentage - Katy and Elton Beauty. However Lord Lambourne is the odd one out of the three, since Katy and Elton Beauty both have the sharp zing of James Grieve and the up-front summery strawberry flavours of Worcester Pearmain. Lord Lambourne offers quite a different taste experience, with more depth and subtlety. Another interesting comparison is with Topaz, a very modern variety and distantly related to Lord Lambourne. Topaz arrives much later in the season but like Lord Lambourne it has some of the classic English aromatic flavour, overlaid with plenty of juicy acidity. Despite being developed nearly a century apart, both these varieties are (arguably) much better apples than their common ancestor James Grieve. Like many of the James Grieve offspring, Lord Lambourne is an easy apple variety to grow in the garden, and produces good crops. It is also (like Katy) fairly easy to find in the UK at farmers markets, and occasionally in supermarkets. Lord Lambourne is, along with Ellisons Orange, one of the earliest of the aromatic English-style apples, and whilst it does not have the complexity of the later-arriving varieties it is nonetheless a pleasing apple in its own right. Love this apple - it just can't deal with arid conditions well. Must strip it of fruit in order for the li'l tree to grow, which I finally did this season. I must find a friend or family member on the soggy side of Washington state to give it to, so I can still enjoy it some years. Great apple; prodigious blooming and easy-care tree, but for the cracked fruit. This has been a record hot and dry summer. The LL apple on the sunny side of the tree took a beating, two large cracks. Yesterday (Sept. 11) I picked it and checked for sugar level: 29 Brix! I checked twice more to be sure. Quite dry due to the cracks, in contrast to last year, and with surprising complexity. The other apples are fine despite the weather. This one generates comments, huh? I had the first taste of LL last fall, just three apples on a midget tree. Decided it will never be big enough standing on Bud9, so dug it up and re-planted it by burying the graft union. It should grow to be a compact standard and yield a crop worth waiting for! Great tasting apple. 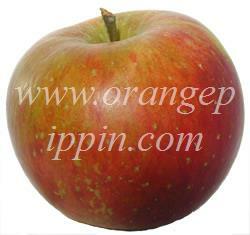 Very similar to Cox's Orange Pippin but earlier by about 3 weeks. Highly recommended. I grow it in Katoomba, NSW, Australia. Picked mine off a small tree at Wisley and was blown away by the taste - slightly acidic, but a lovely background sweetness too. Crispy and crunchy too. Nice skin. Perfect for kids as not too enormous. When I have a large garden in my next dream home, I'll be planting some Lord Lambournes, I think. I have this in Mt Macedon, Victoria, Australia. Great variety. Good yearly cropper, not too acidic. keeps better once picked than Cox's. Great smaller apple for kids to eat. One of my top varieties. if I only had room for say 3 trees, this would be one of them. About a month after my last note on this apple, flower buds appeared on the one-year-old LL! Definitely a partial tip bearer; so pinched 'em off after the bloom and it has grown to about 3 feet tall. Have since seen two references implicating fungicides exacerbating cracks in apples. Since I keep leaf litter cleaned up, this should be a minor issue. I have a Lord Lambourne apple tree with about a ton of apples - are they any good for cider making? Bought a bench graft from Greenmantle in CA last year - on Bud9. Li'l guy is doing fine. Am a bit concerned about the comment from CA about dryness and cracking. My climate is rather hot and dry in late summer. Still hopeful. Never even heard of this apple until my brother introduced me to it. They grow it at his work for testing, and the excess goes to staff and their families. I love both Granny Smith, and Fuji, but I have now found my favorite! Nice acidic bite, but not too tart. Gets sweeter the longer you leave it out, even cut and peeled. Makes amazingly sweet unsweetened applesauce. Dried - they are like candy. They seems to be a very reliable, and heavy producer. I defiantly am going to have to find, or graft one. I love this apple! Ours is at it's best in October. Sweeter than James G, the flavour develops after picking. Definate Cox taste. Same texture as James G, softer than Kidds Orange, which follows it. In our hot, dry climate Lord Lamborne is very productive, but has terrible problems with cracking the last two years. It is on timed drip irrigation and we have no rain through the summer, so I don't think its from uneven watering. Perhaps this is just a reaction to our climate, and if so, I'm sad to have to pull it out. Try Morrisons Supermarket, £4.99 at the moment. I have a bizarre situation at work in White Roding. 4 years ago, I discovered that my employer has a Lord Lambourne apple growing on her grounds. This was because I found its fruit, which I had formally identified. Since that time, we have had no fruit from this tree whatsoever. This may have coincided with the death of a new fruit tree which was planted around the time we discovered the Lord Lambourne tree, but which subsequently perished. Please can you help. 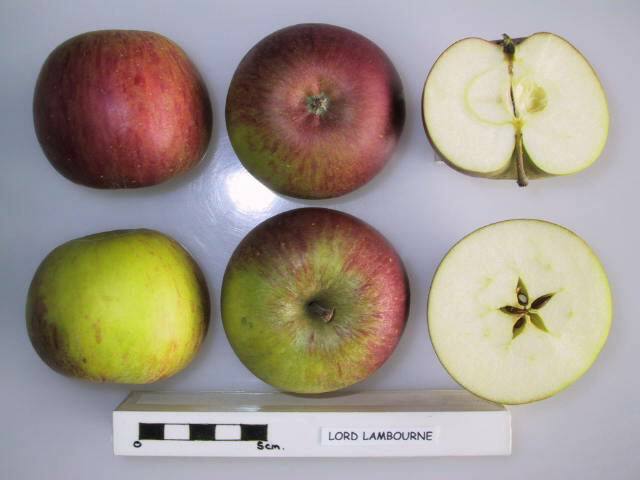 Which apple varieties are good pollinators of 'Lord Lambourne'? Which pollination group do they belong to? Having a Lord Lambourne apple tree, I agree with tasting notes, excellent eater and they also make very good dessert cooking apples. I just bought some from a green grocer in Shoreham-by-sea. Lovely, acidic, juicy number with a crispy flesh. I have recently been supplied with this variety of apple by my local organic fruit and vegetable box company, Flights Orchard Organics. They are absolutely delicious. For me, it's just as important to have the right texture as well as taste. Lord Lambourne's are crisp with a sweet/tart flavour. They remind me of Cox's apples and are the perfect eating apple. I first tasted this apple back in 1956 from a very old tree in my mother-in-law's back yard in Stevenson, WA. I was blown away by it's juicy spirit. Sadly, the tree has disappeared with the decades, but it's strong memory lingers. lord lambourne (1 tree) is loaded this year. delightful eater - but how does one store the huge surplus ? If Nancy Brown lives near Thurmaston could I be really cheeky and pick one of her apples? I am trying to decide on a variety to invest in and would love to try a Lord Lambourne before committing! I have a tree in my garden, planted about 18 years ago. I think it is the best tasting apple around. I just had 2 trees identified as Lord Lambourne. I agree with your tasting notes. They keep nicely but best time to eat is straight from tree Sept (if you can leave them that long). I thought there might be some Cox in there, and i think your description is right on the nail. A Cox-like flavour plus bite and size of the Granny Smith, is what I`d thought. Pete Goldsmith in St Neots, CAMBS.